Kent State University SLIS. Been There. Done That. Got the T-shirt in the Mail. A few weeks ago I put this video together for Dr. Marianne Martens at Kent State SLIS as a guest lecture. I realize it was a little goofy of me to point out how I usually turn off sound etc in any apps I use in storytime and then extol the virtues of Dame Edna’s narration of Olivia, but as a very first Youtube video, I suppose it’s not COMPLETELY horrible. I’m new to this “having anything to say about anything” gig and my public speaking/webinar/guest lecture skills will only get better as I keep talking… and talking…….. and talking about children’s librarians and eBooks. 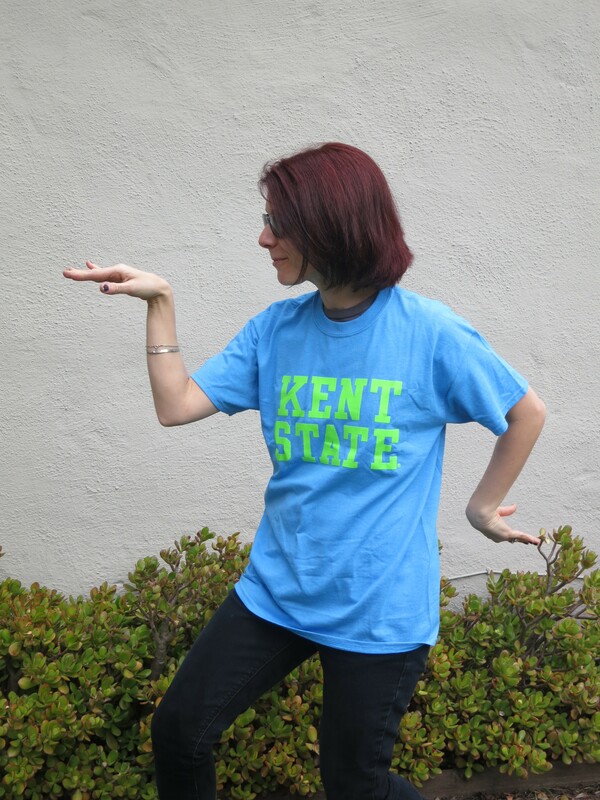 So anyway, today I got a lovely thank-you card and a Kent State T-shirt in the mail. Thank you, Marianne! Please let me know if there’s anything else I can to for you or your students! Posted on March 3, 2013, in YouTube and tagged Guest Lecture, Kent State SLIS, Marianne Martens. Bookmark the permalink. 2 Comments. hi, love your enthusiasm and willingness to share on this site! I’m a library and info student and came across your site via Flowers’ book on YA library services. I have just a small correction – Dame Edna Everage is not British, nor is she transvestite. She is Australian actor extraordinaire, Barry Humphreys. His most recent cinematic appearance is as the Goblin King in The Hobbit. He is one of Australia’s national living treasures, and would probably be horrified to think that he was mistaken for a Brit (but delighted that his narration was well received)! Hi there! Correction NOTED!!!! Goodness; I should have known that. Thank you for pointing it out! Could you send me a link to where you heard about LittleeLit from?